Some are stair-steppers...and then you have me - the scale stepper. I reckon I'm burning up at least 10 calories a day hopping on and off that thing! I am at those scales at least once a day...as though I expect some amazing loss to jump out at me. It know it's a habit in need of breaking, but I thought I'd find out what the experts say to this. An article on NorthJersey.com reports that University of Minnesota researchers have found that frequent self-weighing will not make you depressed. Their findings were published in Preventative Medicine and showed not strong link between scale-stepping and depression in women. 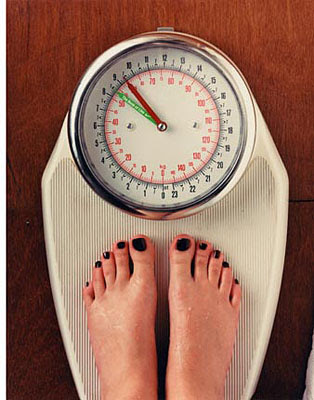 They also found that daily weighing, as opposed to once a week was asscoiated with lower BMI's in women over 40. A study in the Annals of Behavioral Medicine found that daily weighing is helpful "to individuals trying to lose weight or prevent weight gain." However, as Milton Stokes, R.D. of the American Diabetic Association points out:"Weighing daily can lead to an over-reliance on the scale and cause you to obsess about weight. 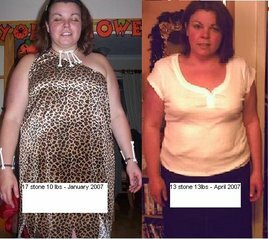 Plus, the scale doesn't indicate when you've gained water weight versus fat weight versus protein and/or muscle weight." He adds that your weight should be based on how you feel and how clothes fit. Sports nutritionist Nancy Clark, R.D., agrees: "You should look in the mirror. If you see less fat, you have less fat. Weight fluctuates and can be misleading -- perhaps you are constipated, holding water from a sodium-rich Chinese meal, or premenstrual." It would seem that a combination of scale-watching and body-shape watching is the key to not only getting to goal, but staying there!